your donation counts as a vote for them. the 2019 Therapy Horse of the Year! Click the "Donate" button and you will be prompted to enter their name. ​You can also vote on at each location and at Round-Up. Online voting ends May 1st. ​awarded with a huge bouquet of carrots and flower sash. Bella’s favorite place to be is out on the trails. Bella loves to stroll the trails at her own leisurely pace and visit all her friends or play a game by the tire. Bella’s favorite thing is to scratched all over, especially under her belly. ​King is a wonderful lesson horse and loves to help his riders progress with their skills. 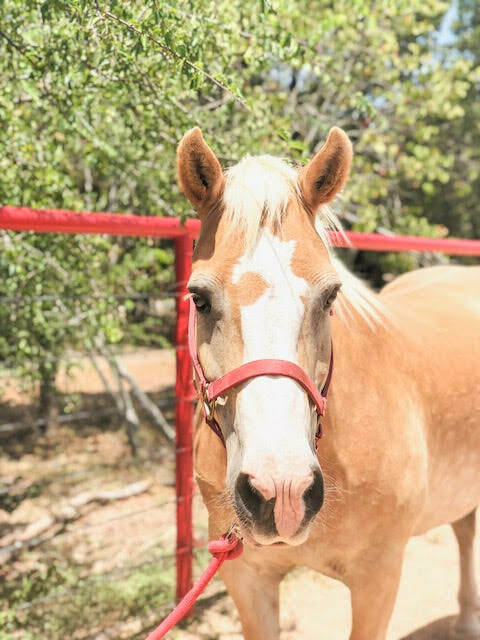 When King was younger he competed and won many American Quarter Horse Association sporting events, including 1999 Versatility Ranch Horse Champion. Denali is new to our herd this year. He is a big stout boy. He has that cool “nothing bothers me” attitude. This boy is not in a rush to get anywhere fast, so be ready to take your time and enjoy his company. Wilma is new to the herd this summer and is enjoying making new friends. She is sure to nicker hi to everyone walking. She loves attention so be sure to say hi and welcome her to her new home. Hans has found his calling as a therapy horse! He has that “nothing bothers me” attitude and loves working with all his riders. Hans is happy working on the trails or in the arena just as long as he is back in his stall at dinnertime. Clayton is very friendly and likes to say “hi” to everyone. He was previously working on a cattle ranch helping check the fence lines and roping cattle. Clayton is excited to learn about his new job and meet all his new riders. Mr. T does not lack personality! He can often be found trying to untie himself or picking up anything in his reach. He loves to watch his riders play games on the trails, he is probably trying to figure out how he can join in and throw the ball too! Max is new to the Dripping Springs herd. He is quickly fitting in with all of his new friends and riders. Max stands out on the trails and in the arena with his pretty white coat. Gigi wants to be everyone's buddy. She loves all her riders and has been know to even video chat with a few of them. She has a great easy going attitude and takes everything in stride. Her favorite treat is peppermints. Previous Experience: 4-H show horse and therapy horse at A.W.A.R.E. Newest to the San Marcos herd. Bailey is fitting right in and loving working as a riding lesson horse to all her new friends. 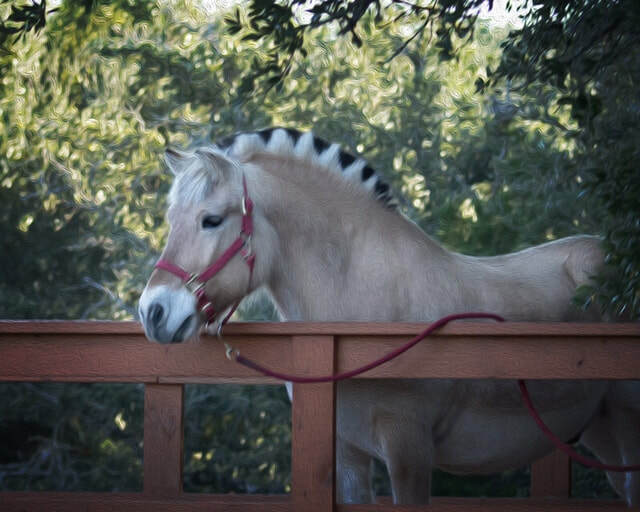 Freya is known around the barn for her beautiful blonde mane and tail. Freya has a certain “joie de vivre” (love of life) and loves to trot with her ears up wherever she is going. Freya is not shy around water and is often seen hanging out in the pond. Previous Experience: Show Horse, therapy horse at Stable Strides and A.W.A.R.E. Maggie genuinely loves her job and her riders. At the end of every session, she gives her rider the biggest sniff and sweetest nuzzle with her soft nose. One sniff from Maggie can really make your day! Sven lives in "Sven World" where he is always calm, happy, and in no hurry. He can be found in the pasture following around his sister, Maggie. He enjoys attention from his riders. Stoney is a horse he can do it all, he likes to get dressed up for horse shows and he likes to work at the barn doing therapy sessions. Oden loves to please people as he begins to learn his job as a therapy horse. Where as Thor is very curious and has a mind of his own. Both can be found playing with each other in their pin or following their friend Denali around the trails on the weekends. They are always up to something! One thing we are sure of is that they will make great therapy horses one day! Previous Experience: Just a baby! Scout and Brodie are our smallest horses in the herd. They love to participate in our reading program, job training program, or go on field trips to meet new friends. Mostly, these two love a good photo opportunity.